There’s been a programmer test that was used for awhile to see if a simple program could be constructed. 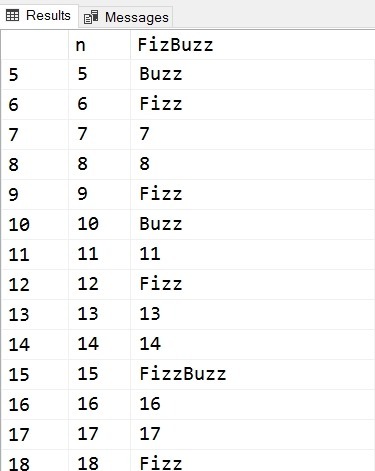 It’s FizzBuzz, after a kids game, and designed to see if someone knows some logical program construction. It’s a simple test, but I wonder how long it would take you to write it in T-SQL? It took me about 2 minutes. Give yourself a little quiz today. For a challenge, also produce this in PoSh or some other language. I took about 5 minutes in PoSh, mostly because I had to look up some syntax. In case you think this doesn’t matter, I agree with Jeff Atwood. I’d like to look at someone’s code before I interview them for development. They should have some public code, maybe something they recommend. If you’re looking for a blog topic, show us you can write this code. I don’t know if it took me 2 minutes. I will say this, it ran the first time with the expected results. After reading the article it does amaze me that there are developers that would struggle over such a simple assignment. I agree. Seems simple to me. we could argue slightly about the result set that should be displayed, but just getting the results should be easy.